Conspiracy theorists are claiming that dramatic new photos prove that The Sun is in fact hollow, and may even contain a whole alien world. Most scientists believe that the Sun is made of hydrogen, magnesium and a few other elements, but a UFOlogist has made a bold claim that photos taken by Nasa’s Solar and Heliospheric Observatory (SOHO) satellite prove them all wrong, the Daily Mail reports. The photos seem to show a colossal door on the Sun opening up to allow alien ships to pass in and out. For those not in the know ‘The Hollow Sun Theory’ claims that the sun is in fact hollow and contains a whole alien world. 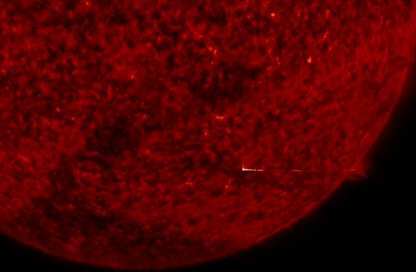 The bizarre pictures were discovered by the alien hunter, TheWatcher252, who spotted ‘a massive oddly shaped anomaly passing through the sun’ in photos taken on March 14, 2016. Soon after Scott C. Waring, creator of UFO Sightings Daily, shared the discovery with his readers. Waring is now claiming that the snaps prove The Hollow Earth theory. A giant door opened up on the sun this week, just a little bit, but enough to make a crack across the sun and through the crack shined pure white light of the world inside… It opened up just enough to allow motherships to exit or enter. For many UFO researchers it is believed that the sun itself is an artificial structure, with a flaming camouflage on the outside and a massive world 1000X our own on the inside. This photo as rare as it is, confirms that theory.